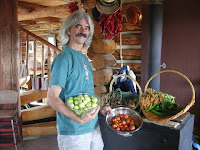 This is Part II of an interview with Gary Entsminger, editor and publisher of Pinyon Publishing and the Pinyon Review, about Growing Your Own Produce. 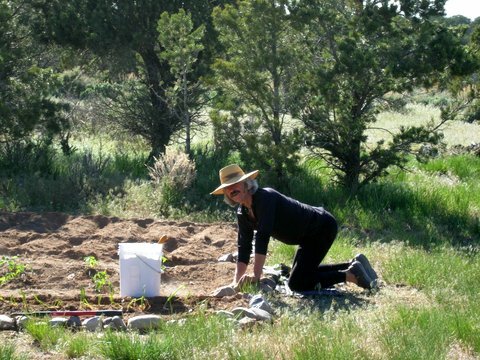 Gary and Susan Elliott, who does the artwork for Pinyon, have a home garden that supplies a significant part of their vegetarian diet, and they take time from book publishing duties to cultivate and maintain this garden on the Uncompahgre Plateau in the Rocky Mountains of Colorado. Moore: When we exchange e-mails weekly, you’ve often just finished a batch of sauce or salsa verde for preserving. Is preserving food an expensive process? Entsminger: It depends on how you count costs. From garden to canner takes time and work. If we were paying ourselves by the hour it would be cheaper to buy from the supermarket. But we do this for pleasure as well as the rewards, and as I said earlier, this is about tradeoffs. We know exactly what goes into our gardens and our canned goods. Moore: Do you use special cookware for preparing food for preserving? And do you use special seasonings when you’re cooking up a sauce or other food? 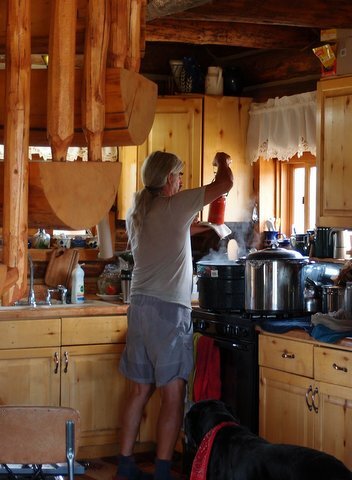 Entsminger: We prepare much of our food, for canning and daily cooking, in cast iron skillets and Dutch Ovens. We make a variety of tasty sauces and salsas simply by varying the ingredients (e.g., more chilies make a better bean enchilada sauce; fewer chilies might be better for rice, fewer yet for pasta). We’re vegetarians and eat some variation of beans, potatoes, rice, or pasta almost every day. Any of our canned sauces can be turned into a sauce for Indian, Italian, Mexican, or American food easily. We don’t season any of our sauces and salsa except with the fresh produce (onions, garlic, chilies) that we use when canning. So, later if we want to create an Indian dish, we can add Indian spices. Ditto for others (Mexican, Italian). But we always add a pinch of salt, olive oil, vinegar, and lime juice to all our sauces and salsas. This increases the basic flavor and also increases the acidity for safer preservation. Moore: I know you make a lot of salsa verde because you've written me enough times after you've prepared a batch of it to make me hint for a jar of my own. What else do you and Susan can? 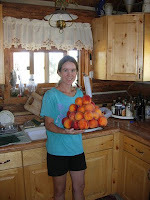 Entsminger: We also can roasted chilies, peaches, peach jam, applesauce, and dill pickles. This summer, like most years, we preserved 90-100 quarts of the vegetables and fruits I mentioned, and I’m pleased to say that none of our produce traveled more than 20 miles. So we’re helping to bring down that 1000 mile average of tomato travel in the US. Moore: You've also mentioned to me that you have a greens garden, with kale, chard, spinach, and others. How much of the year can you maintain a greens garden? 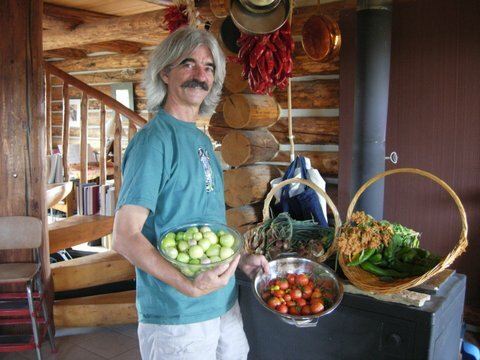 Moore: Do you have caveats to add about home gardening and preserving the “bounty” you harvest? Entsminger: Yes. Our approach probably wouldn't work for most modern Americans who commute an hour or more each day to work. But that’s also another trade-off. 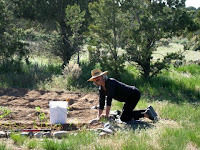 We work out of our cabin, and thus we have that commuting time to garden and preserve. Ours is an old fashioned approach, but it still remains the best one for us. A few blogs ago, during August, I wrote about visiting friends in Georgetown, D.C. and mentioned how I appreciated the contributions those friends had made in the music realm, the literary world, and the social service realm. 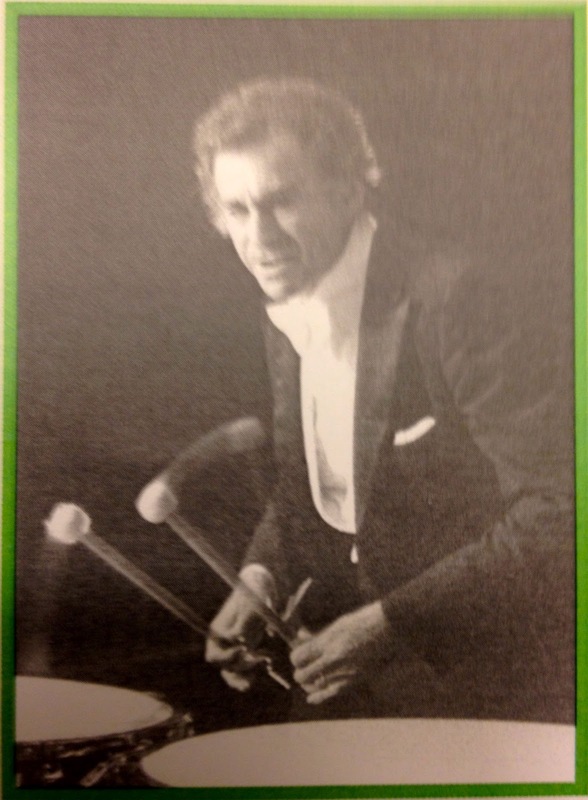 I talked about Freddie Begun’s fame as a timpanist and composer with the National Symphony in Washington, D.C. and Jane Bonin’s contributions as a playwright, professor, writer, and Peace Corps director in Africa. We enjoyed a delightful get-together, and I came away feeling that I had been in the company of two wonderful, enlightened people I was fortunate to have as friends. A few weeks later, I received word that my friends had been in a horrific wreck and were in intensive care with multiple fractures. Jane was eventually discharged from the hospital, but Freddie worsened daily, and yesterday, he died. Although my friendship with Jane is a long term relationship of forty years, my acquaintance with Freddie was short-lived, a friendship of three years. Freddie and Jane had been inseparable for seven years, and they came to The Mountain at Sewanee, Tennessee for a week visit with Jane’s daughter and husband over two years ago. While they were here, we enjoyed many lunches and dinners together, and although I admired Freddie’s musical talents, the most distinctive quality he possessed that impressed me deeply was the way he showed gratitude to his hosts and hostesses. Like people in Cajun country, Freddie regarded meals as celebrations, and whoever put on a dinner or took him to lunch received the equivalent of a standing ovation for having taken care of him. Following a meal, he’d stand up and ask for quiet, then deliver a long toast, an “after blessing” that acknowledged the efforts of those who had served him, those who had prepared for him, and those whose company he shared at the table. He was not a toast master; his thank yous were bountiful and genuine. In an age and society where I think gratitude is not so openly acknowledged anymore, Freddie was a rare person. He was a Jew, and I think that he exemplified the conscientious Jew who had been taught the theology and practice of gratitude from childhood. It was obvious that one of the overriding ideas in Jewish thought is that of acknowledging the blessings which are a part of your life -- a good Jew takes time to recognize and celebrate the life he has been given. Taken to the extreme, one of the most moving stories I’ve read about Jews showing gratitude to God for their lives is that of Holocaust victims reciting the Shema on their way to being exterminated by the Nazis. “What does a good guest say? How much trouble my host has taken for me! How much meat he set before me! How much wine he set before me! How many cakes he has set before me! And all the trouble he has taken was only for my sake!” I could hear Freddie echoing those words and inviting applause for his host or hostess afterward. That reading from the Talmud must have been engraved on Freddie’s heart because he expressed simple gratitude for those celebrations each time we were together. I rejoice in having known someone who felt so grateful for the blessings of his life, which included the many friends whose lives he touched with kindness and a grateful heart. Mazel tov, Freddie! 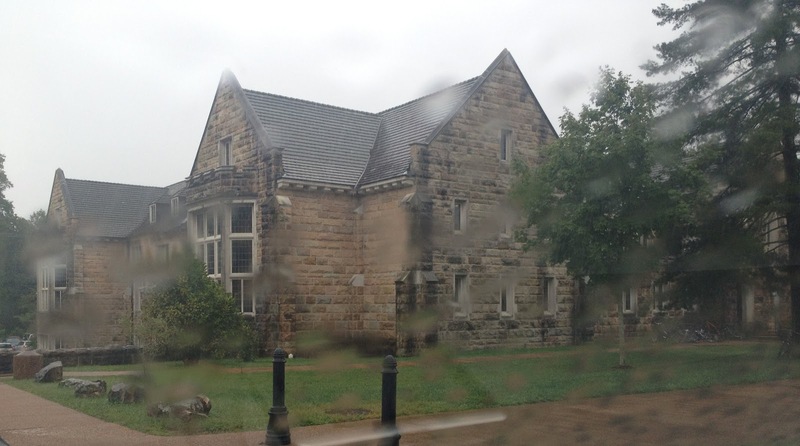 For five years, I passed a dingy stucco building on the highway between Monteagle and Sewanee, Tennessee and remarked how forlorn the building looked. It appeared to have housed an enterprise of some kind or a small family. “I wish someone would buy that place and renovate or restore it,” I’d say when we passed, but, then, I dislike abandoned buildings of any kind – home, business, motel, schoolhouse – and I suspected that the little structure would be torn down in a few years. 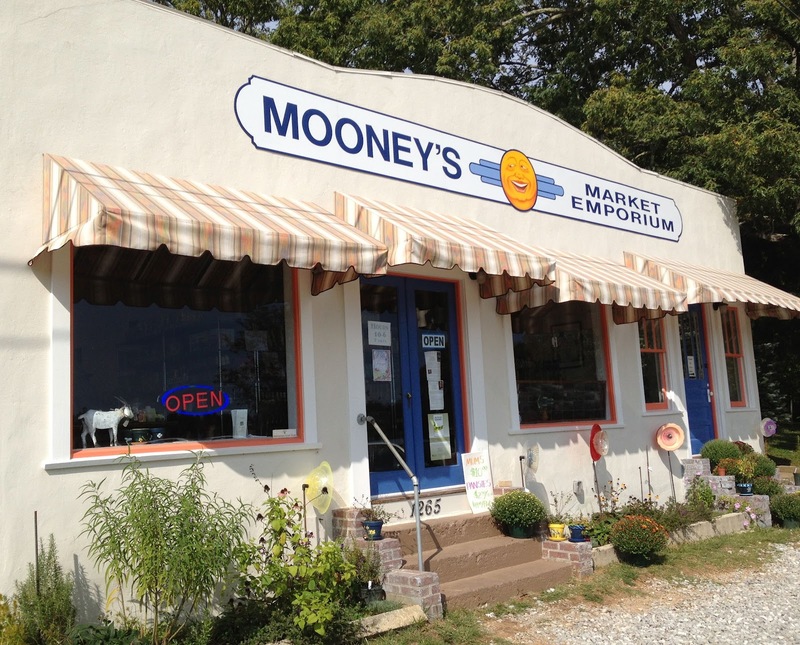 This year, when I returned from Louisiana where we winter and neared Sewanee feeling my usual reluctance to change homes for the season, I smiled widely when I saw that the little stucco building had been restored and bore the name “Mooney’s Market and Emporium” on its freshly-painted exterior. Since that time I’ve frequented the place weekly and enjoy talking with Joan Thomas, the proprietor. Joan, a witty woman with long blonde hair, has the kind of hospitable manner that makes a specialty grocery successful, and she also has a background in bookkeeping that keeps the store operating in the black. Mooney’s occupies a building that was once a grocery called “Sanders,” owned by a family named Sanders who sold groceries in the big front room on one side of the structure and used the rest of the house as living quarters for the family. The road in front of the grocery was called Dixie Highway and was a graded and graveled road until it became Hwy. 41A. 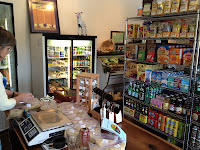 Mooney’s inventory includes 90% natural foods, “and some gourmet fluff,” Joan says. A vegan since she was 15, she says she really learned about the value of food when she quit eating meat. A garden in the rear of the grocery attests to her interest in vegetables. 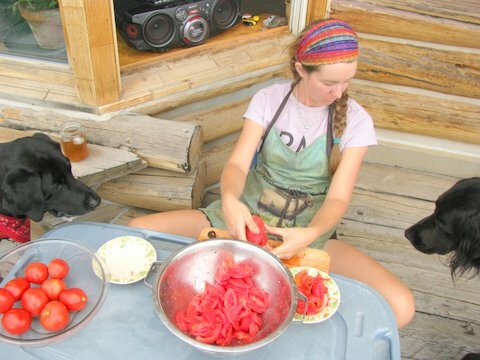 In the small space, she grows tomatoes, kale, okra, herbs, and other vegetables according to season, a bounty that she sells along with foods from the Sewanee area, including local cheeses. The store also houses a weaving/spinning room where Joan weaves and Claire Cage spins. The back rooms contain antiques on consignment from Anne Sherrill, a dorm matron for dormitories on the campus of the University of the South, and assorted furniture and books from others. When I interviewed Joan, we sat at an old ice cream parlor table on the back porch and chatted about her background, which is as interesting as Mooney’s. A native of Cleveland, Tennessee, Joan has lived mostly in Tennessee, with a hiatus in Seattle, Washington where she tried her wings as a bookkeeper for television and the theatre and did food styling for commercials. “I also did some cooking for a cooking show – you know, dump and pour,” she said, laughing. Joan moved to Sewanee in 1985 to house sit “Brinkwood” on the Natural Bridge Road near Sewanee, a home that was in the family of the famed author Walker Percy and which she house sat for seven years. She married her first husband, and when Brinkwood was sold, she helped establish Link Farm on 1,200 acres in the Jump Off Community Land Trust near Sewanee. There, she and her husband initiated a gardeners’ market, a food coop, and began making a community like one that they envisioned a “community should be.” Joan related that for awhile, she lived in a teepee, then “built a home and divorced, in that order.” We agreed that couples who build a home together from foundation upward often divorce during the planning and building process. When Joan moved to "The Farm" in Summertown, 120 miles west of Sewanee, she joined an intentional community that had formerly been a famous commune where each member of the community signed a vow of poverty and pooled whatever possessions he or she had. In this community Joan met her second husband, Michael Lee. The Farm is now privatized, but it remains an intentional, gated community. 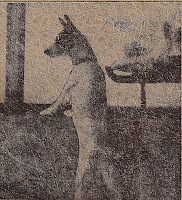 Joan and her husband later established a contracting business in the area. “Then I broke my leg,” she said, “which must have been a way to get out of the business because I foolishly climbed up on a 20 ft. ladder and fell off.” Her contracting background proved valuable when she and her husband restored Mooney’s. They maintained the authenticity of the old structure, repairing rotten boards, reframing and refinishing floors in other rooms, reusing all the old materials to restore the home. Joan took on the job of painting, applying three or four coats to the exterior and interior of Mooney’s. However, she had learned her lesson regarding ladders and didn’t volunteer to paint the ceilings. The outcome of the appraisals “it’s not so bad” is a structure that would qualify for a National Historic property, a neat small-town marketplace boasting a colorful awning and sign with a smiling moon that attracts customers from mid-Tennessee and from throughout the U.S. and other countries. Joan plans to expand Mooney’s to include a restaurant, a travel trailer in the side yard that will be used as a kitchen to prepare wraps and sandwiches for patrons who can pick up lunch from a window ledge on one side of the trailer. She employs one assistant, Rebecca Newton, who works part time at Mooney’s and never seems to be done with packing grains and loading shelves. 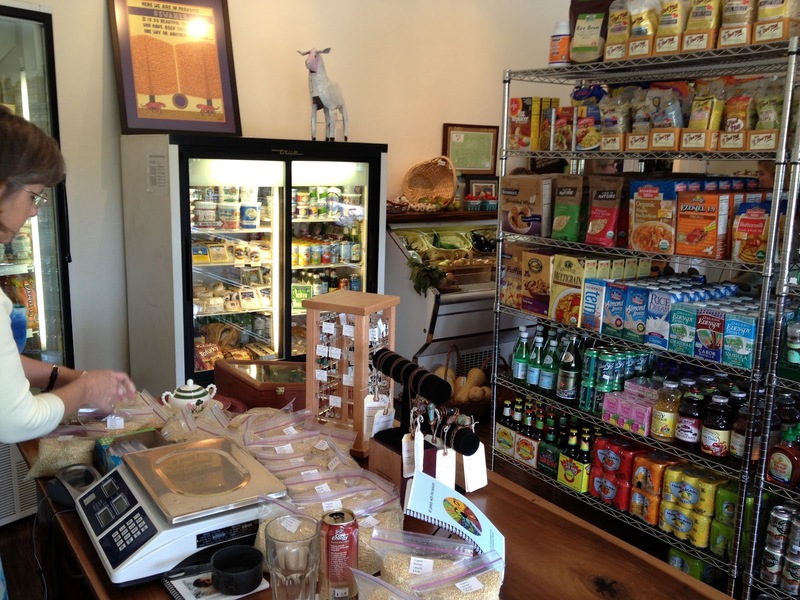 Rebecca shares Joan’s love of the market/emporium but has a second job as an editor. For seven days, we’ve been wood shedding at Crossville, Tennessee, a hilly town northeast of Sewanee in the Cumberland Mountains. 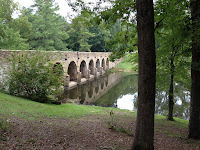 Although the purpose of the trip was to hibernate and work on a new young adult novel, I always manage to get in a sightseeing trip – particularly if I’m near one of the many parks that the WPA (Works Progress Administration) and CCC (Civilian Conservation Corps) built when these wonderful organizations were set up by President Franklin D. Roosevelt following the Great Depression. My father was among the numerous men who would have starved had he not been employed in the programs that constructed bridges, state park structures, roads, and walls along highways throughout the U.S. Videos about the work of the CCC’s can be viewed at the Roosevelt State Park where Roosevelt established his retreat in the “Little White House” near Pine Mountain Ridge, Georgia. Buildings constructed of stone and other materials indigenous to the area, as well as a stone swimming pool and lodge, were also constructed by the CCC’s in that location. Tennessee has a grand share of state parks that feature the work of the WPA and CCC’s, and Cumberland Mountain State Park near Crossville boasts of the Crab Orchard stone dam/bridge that is a magnificent landmark (shown above). It’s reputed to be the largest masonry structure constructed by the CCC. Many of the buildings in the park were built of a local rock called Crab Orchard sandstone which residents around Crossville have used to build their homes. The Cumberland Mountain State Park contains 1720 acres on a sandstone tableland of the Cumberland Plateau. As we drove through the forest, we looked for deer, rabbit, and fox that park officials touted as local wildlife in the area.This land south of Crossville was first acquired in 1934 as a project of the Farm Security Administration to create a recreation area for 250 families selected, under The Homestead Act, to homestead in Cumberland County. They were to build a self-sustaining community and colonize this sparsely populated section of Tennessee. The town of Crossville was economically depressed for many years, but a bustling economy and many cottage industries located within the city and on its outskirts attest to the Homestead Act’s vision of future success for the area. The famous Cumberland County Playhouse in Crossville has gained popularity as “one of the top ten theatres in rural areas of the U.S.”. Established in 1965, it serves 145,000 patrons annually, offering a venue of works based on Tennessee and southeastern history and culture and featuring Appalachian themes. We bypassed a musical based on Ginger Rogers' career as a dancer to attend the movie, "Hope Springs," but picked up a schedule for upcoming productions at the Playhouse. Inside the Cumberland Mountain State Park, cabins and a large Mill House Lodge are available for people seeking refuge in the outdoors, and reservations have to be made early – some as long as two years in advance! For golfers, a Jack Nicklaus 18-hole course makes the best of hills and flowing streams, and the course has a signature 7th hole that showcases layered flagstone native to the area. Visitors who work up an appetite can sample the fare at the Cumberland Mountain State Park Restaurant, open six days a week, that features a special Rib Night and Catfish Day. From the puff I’m giving the area, you can surmise that we’re going back soon, particularly since I discovered that Byrd Lake in the park is stocked with bass, catfish, crappie, and rainbow trout. A long time has passed since I last cast a fly rod, and I’m going to retrieve mine from Louisiana when I return to Cajun country. This morning, I have been re-reading one of my favorite poets, Robert Francis, a New Englander and contemporary of Robert Frost. Francis always inspires me because he was an example of a poet who persisted in being authentic in his life and work, living in virtual poverty after he built a house called Fort Juniper in the woods and fields near Amherst, Massachusetts. Francis built his poet’s retreat with an inheritance of $1,000 from his father’s life insurance. He survived on a few hundred dollars a year for at least sixteen years while he wrote poems, gave music lessons, and owned, as I once wrote about him, “freedom and leisure.” A vegan, he subsisted largely on produce from his home garden and, for many years, walked to town for needed supplies. In a journal that Francis kept for the years 1930-1950, he records that he received 641 rejections for his poetry before he was finally published, and, then, he was never as well-known as his friend, Robert Frost. He noted that two of the portraits in the Jones Library at Amherst, Massachusetts, were of poets, and he was one of the two. Francis writes: “It [his portrait, which was labeled “poet”] gives me something of a start and also a satisfaction to be summed up in one word. I submit to the label. I am enough of a poet to be called a poet. Some day I may be more poet still…” And later in life, he did become more of a poet but utilized less and less words. Francis’s words resonated with me today when I finally sent to press Everything Is Blue, my 14th book of poetry and 32nd book. Friends once chided me because I wouldn’t claim the title “writer,” even while I churned out articles, poems, and, finally a book in 1980. And until less than ten years ago, I didn’t claim to live so rich a life as that of a poet. This morning as I re-read Francis, I identified with his final submission to the idea of being a poet. Everything Is Blue was inspired by one of my brother Paul’s paintings–a seascape rendered entirely in shades of blue, with the slight contrast of a silver sea gull winging through the blue sky, and his painting provided the cover for my 32nd book of poetry. 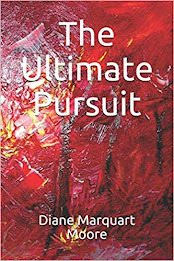 My grandson Martin, who designs all of my book covers, designed the cover using Paul’s painting. Everything Is Blue contains a title poem inspired by the painting, poems about travels to southern locales–including deceased writers’ homes–meditations about the sea, a wry poem about robots’ place in the post-modern world, the value of growing mint, and others concerning the spiritual life, with an end poem about the place of memories in a contented life. God has corrected all his mistakes. the cry in the night, a useless sound. 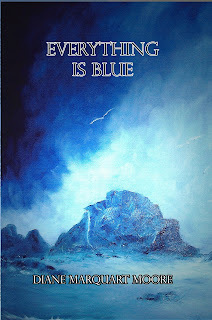 Everything Is Blue can be ordered online by clicking the title, or by snail mail from Border Press, P.O. Box 3124, Sewanee, TN 37375 after September 20, 2012.